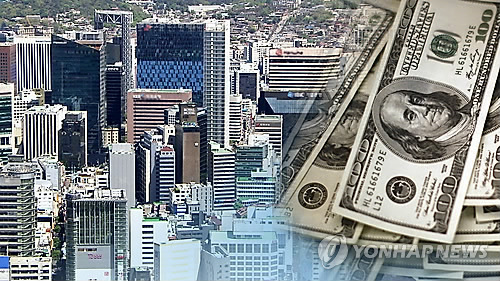 (SEOUL=Yonhap News) This year's Foreign Direct Investment(FDI) to South Korea set a new record-high, with the 4 year straight annual input of over US$20 billion. On 28th of last month, the Ministry of Trade, Industry and Energy(MOTIE) said the registered FDI commitments to South Korea are worth $23.04 billion, already breaking last year's record of $22.94 billion. The actual investment made so far reached $13.79 billion with an annual increase by 22.4%, already exceeding last year's($13.51 billion). FDI to South Korea has experienced a steady increase since the first reach of US$20 billion in 2015. On Oct 15, it became clear that South Korea would write a new record of attracting over US$20 billion worth of FDI for 4 consecutive years. The amount of FDI by countries are: European Union(EU) $7.1 billion, the United States(US) $5.1 billion, China $2.56 billion, and Japan $1.12 billion. Compared to the rise from EU, US, and Japan by 24.4%, 37%, and 36.6% respectively, FDI commitment from China rose by 252% despite the conflict it had with South Korea regarding THAAD. A source from MOTIE said "Last year, China put a limit to its foreign investment to South Korea, not to mention the restrictions pertaining to THADD. But since the Korea-China Summit in last year January, we see increased foreign investment from China." "We will hold an IR event with KOTRA in Beijing on 4th of next month," the source added. By sector, the manufacturing industry including machinery, precision equippment and shipping drew $9.27 billion of investment pledges, with a 38.1% increase from last year. The service sector including distribution, ICT, and etc. drew $12.6 billion of investment commitments, with a 0.9% increase from last year. By type, green field investment in which a foreign company builds its operations plant in S.Korea has come $17.45 billion(up by 31.6%), and the M&A in which a foreign company buys shares of a Korean company is accounted as $5.59 billion(up by 12.4%). According to MOTIE, "talks between the South and North Korea and between the U.S and North Korea mitigated geopolitical risk on the Korean Peninsula, creating a positive environment for investors." "This led to active foreign investment in materials and components of Korea's main industries such as memory chips and display, and attracted strategic investment in sectors such as bio, digital content, and mobile banking." said the Ministry.